Y-Knot Flowers is a Full Service Florist. While we are best known for our wedding flowers, we also offer design and décor services for any special event. Just think! You can upgrade the look of your Quinceañera, Bar Mitzvah or Bat Mitzvah, Corporate luncheon, Holiday Party or Graduation Party with flowers! Your bridal bouquet is the cornerstone of your entire wedding décor, so we start by designing your personal flowers first, by creating your dream wedding bouquet, then scaling it down a little for your Maid of Honor Bouquet and your Bridesmaid's Bouquets. Your Groom's Boutonniere was traditionally a flower plucked from the bride’s bouquet and tucked into his buttonhole, which is where the word Boutonniere came from. We design the rest of your bridal party’s flowers to coordinate with your dream bridal bouquet. The boutonnieres and corsages will have a similar design for perfect continuity. Once you have chosen your bouquet with the help of one of our floral designers, we move on to beautifying your wedding ceremony. 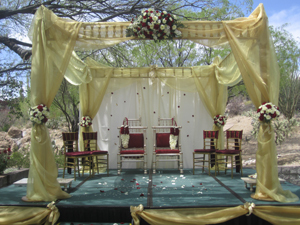 Our rental department can help with the wedding structures such as Wedding Arches, Chuppahs and Mandaps as well as Columns for the aisle, a full ceremony Colonnade, or Candelabra for a candlelight ceremony. If you need a backdrop to hide the choir pit at the church or a blank wall in a backyard setting, we can create that as well. Imagine a petal strewn organza backdrop or a curtain with hanging crystals that sparkles in your pictures. Your aisle is important as well, and whether you want something as simple as bows, or as extravagant as floral arrangements on columns with draping in between, Y-Knot Flowers can handle it! If you want to feel like royalty, we can also create a petal strewn aisle, or line your aisle with petals for a softer look. We can also design a Unity candle arrangement or memorial arrangement and we offer sand ceremony designs as well. After the stress of the wedding is over, it’s time to get down and have fun at your reception, but wouldn’t it be more fun if your guests were WOW’ed as they walked into your reception? From romantic tabletop candelabra to large overhead floral centerpieces, we can create a breathtaking look that you will always remember. We also do full service event design, so we won’t forget the head table décor and the cake table décor, or a backdrop for pictures that coordinates with your linens. Having a backyard wedding? We can bring in everything from the tent to the forks, and then coordinate the flowers for the tables as well. From the tradition of the first pair of high heels being given to you by your father to the tiara which signifies that you will always be your family's little princess, Y-Knot Flowers can help with your Quinceañera décor. Your bouquet should reflect your personality, and we can help with the flowers for your Corte de Honor as well as the church and reception décor. Looking for a great Mitzvah theme? Our ingenious decorating crew loves to come up with new ideas for themes. From Sports to Shopping to reading, we can help you come up with a great look that projects your personality. Let us create a very special candlelighting ceremony designed around your theme too. We have decorated corporate events such as the 2006 NACE Convention www.nace.net , The 2010 ABC Convention www.bridalassn.com, the 2010,2011 and 2012 Mesa Chamber of Commerce Awards dinners, networking events for MPI, Gilbert Chamber of Commerce, Chandler Chamber of Commerce and so many more. 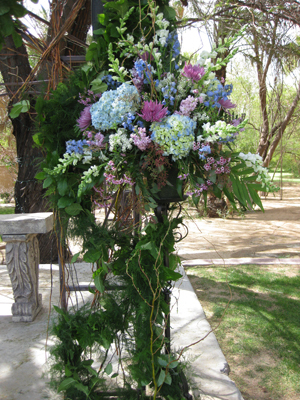 Our compassionate floral designers can help get you through the hard choices that need to be made for celebrating a loved on'’s life. We can take the flowers that were special to your family member to create a loving display as you say goodbye.